An upbeat Prime Minister yesterday backed economic liberalisation focused on investment but also acknowledged stronger policies were needed to protect local businesses with the anti-dumping bill earmarked to be debated in Parliament today. Speaking at the 59th Annual General Meeting of the National Chamber of Commerce, he said one of the aims of the Government’s outward-looking economic policy was to develop Sri Lankan business on a global scale. “We have to think big, don’t think small. In the next decade our idea is to rationalise and open out the economy to allow Sri Lankan businesses to grow. Every measure we take will encourage Sri Lankan companies to make money but we need an outward economy with dynamic Sri Lankan enterprises. Don’t ever be frightened to expand and grow. This Government will help you. Don’t think an outward economy is bad for us. All you need is the mindset and take the opportunity. We want Sri Lankan businesses to thrive,” he said. To support local entrepreneurs, the Prime Minister said they have decided to set up a Development Bank, with the Government functioning as a stakeholder, while extending an open invitation to all banks to be a part of it. He also said that they were looking at ways and means to enhance money flow into the SME sector. “Let us work together so that in the next two years we can pump more money into the economy,” he quipped. Thereafter, it took another two decades to earn the capital and get going, he added. The Premier asserted that the country must now focus on the development path noting that politics should not hinder the growth of the economy. Highlighting that Sri Lanka signed a free trade agreement (FTA) with Singapore which is the first in 15 years, he said it would lead to many more as it was essential to expand the market horizons of local enterprises. The Prime Minister said it was going to be busy with many state visitors and business delegations from Singapore, Indonesia and Japan coming in. However, he said in deepening the FTA with India, the Government’s main objective was to remove the non-tariff barriers, insisting that if they were not removed the FTA became pointless. Pointing out that technology and open trade were key factors in today’s world for an entrepreneur to crack into the business world and be successful, he insisted that the private sector had to grasp the opportunities. Reiterating the fact that foreign investments never hinder the growth of an economy, he stressed that Sri Lanka was one of the first British colonies which benefited from foreign investment as it ventured into the plantation sector later where Sri Lankan entrepreneurs followed suit and became successful local businesses that had today diversified into many sectors. He said it was also evident in the apparel sector, with many large companies owning big brands catering to developed markets all around the world. The Prime Minister also said that they would soon sign a Memorandum of Understanding (MoU) with Four Seasons Hotels and Resorts. “We are now signing a MoU, where Four Seasons Hotels and Resorts will come and do a joint venture with the Bank of Ceylon (BoC) for the original Grand Oriental Hotel (GOH). This is just the beginning. Do you know that there are another 10 heritage buildings in Colombo Fort? We are going to up the prices with this one. Just imagine that whole area with boutique hotels and other hotels?” he added. 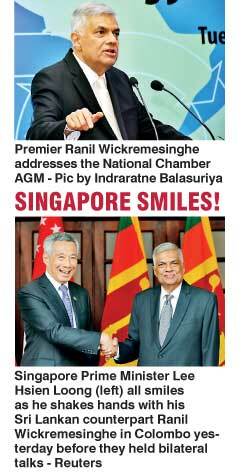 Wickremesinghe also said that he would call on all the chambers to discuss the way forward for the economy and to resolve matters concerning the private sector expanding businesses.